The substance-abusing strongman Bane gets more than he bargained for in a back alley cage fight. The latest issue of the Batman: Arkham City digital comic has unveiled a new threat for Batman to face: the vicious and powerful Bane. The character also appeared in Arkham Aslyum, but it sounds like this time round, it will be closer to the Bane that comic book fans know and love. The summary for the comic says that a bored Bane sets up an extreme fighting ring in Arkham City as a way to pass the time. Unfortunately for him, there's a shortage of opponents that can offer him a proper challenge. That is, until a seemingly "lackluster" opponent takes him by surprise. Over the course of the comic - and if you want to avoid spoilers, then you should stop reading now - the reader learns that Titan, the drug that the Joker wanted to use in the first game to make an army of super-powered monsters, isn't impossible to get in Arkham City. The Joker sends a lackey does up with Titan to challenge Bane, in the hopes of eliminating him. 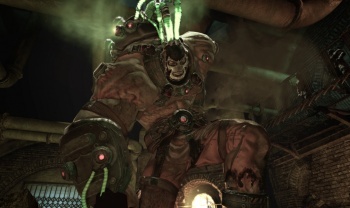 It's also revealed that the effects of Titan - which Bane got a hefty dose of in the last game thanks to the Joker - do wear off over time, and that Bane had a safehouse in Arkham City, giving him access to his Venom: a drug similar to Titan, granting Bane superhuman strength - albeit less than Titan delivers - but allowing him to keep his mental faculties as well. It sounds like Bane's role in Arkham City will be rather complicated, not exactly an ally, but not exactly an enemy either. As a fan of the Batman comics - where Bane is a criminal genius as well as a walking mountain - it will be a welcome change to see the character used in some capacity other than dumb muscle.